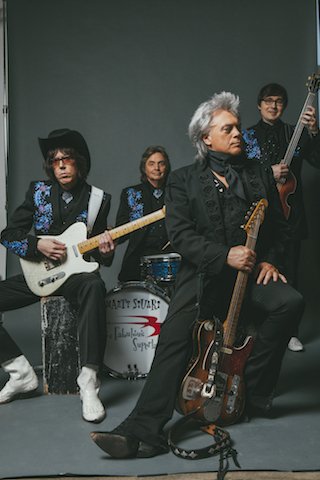 Give Marty Stuart credit for conducting his post-MCA Nashville solo career in an unpredictable manner that has given us great gospel outbursts (Souls’ Chapel, 2005); powerful tributes to Native Americans (Badlands: Ballads of the Lakota, 2005); country music’s eternal battle between the sacred and the profane (Saturday Night/Sunday Morning, 2014); a Faulknerian concept album of Big Themes—adultery, alcoholism, wanderlust, violence both physical and metaphysical, spirituality and family—explored in traditional country and bluegrass styles with a modern flourish (Pilgrim, 1999), to name a few gems. 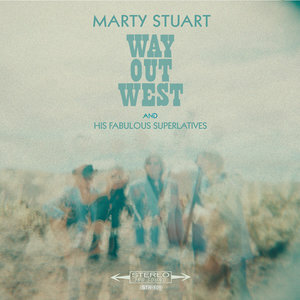 Although Way Out West is bookended by “Way Out West,” initially in the minimalist form cited above, and at the close in another heroic instrumental version with twanging and chiming guitars, stomping percussion and soaring strings judiciously deployed for atmospherics, it’s not about narrative but rather about the West as a state of mind, about a feeling; and, as a corollary (intentional or otherwise) treatise on the schizoid nature of America in the nascent Trump era when so much seems suddenly unsettled, and occasionally outright crazy, here and across the globe. So why not jump from a pill-fueled desert odyssey (“Lost on the Desert,” perhaps appropriately summoning the spirit of one John R. Cash but those multi-colored conscious altering skittles may well be metaphorical stand-ins for the splintered reality we live in now), to Old Mexico, to the tumultuous ‘60s in surf- and “Rumble”-inspired instrumentals “Quicksand” and “Torpedo, to the open road, and ultimately into the heart—in the soft strings, reverbed guitar and soothing rhythms of “Please Don’t Say Goodbye,” one of Stuart’s most affecting heartbreakers, and most movingly in the quietude of the acoustic-based “Wait For The Morning” (“in the name of peace, we shall be released into the Kingdom Come”) with its suggestion of redemption and salvation ahead?